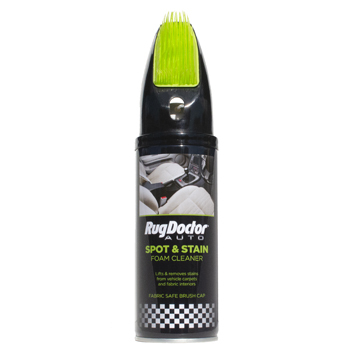 The Rug Doctor Auto Spot and Stain Foam Cleaner comes with a handy, integrated, fabric-safe brush that tackles even the most ground-in, stubborn car upholstery stains with ease. Rug Doctor Auto Spot & Stain Foam Cleaner is formulated to target stains and spills on your auto upholstrey. With it’s handy, integrated, fabric-safe brush tackling the most ground-in, stubborn car upholstery stains is easy. The specially formulated foam cleaner will leave your car clean and odour free. Do not use on velvet materials, rayon, silk, brocade, vinyl, suede, leather, oriental rugs or those fabrics and materials not suitable for wet cleaning. Safe for use on wool. Before use always test on a hidden area of the same fabric for colour fastness or any adverse reaction. User assumes all risks. For best results treat stain immediately. 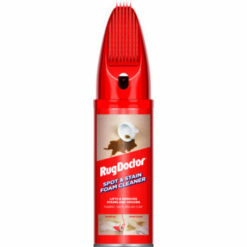 The Rug Doctor Spot and Stain Foam Cleaner comes with a handy, integrated, fabric-safe brush that tackles even the most ground-in, stubborn carpet and upholstery stains with ease.